Student in the University of Baltimore have the option to take a Fully Online MBA, or a Flexible part-time MBA. Both programs offer the same curriculum, which is comprised of 36-48 credits and 11 specialization offers. 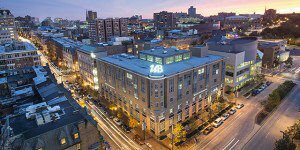 Additionally, the school offers dual-degree options, so students can earn their University of Baltimore Flexible MBA along with a graduate degree in another field. With evening classes at two campuses and online classes, plus traditional 15-week and accelerated seven-week formats, the school offers flexible scheduling that works for working professionals. There are currently 513 graduate business students enrolled in the Merrick School of Business, with 388 students in the Fully Online MBA. Tuition for the in-state students in the Fully Online MBA program is $2,403 for three credit courses. With fees, this total comes to $2,683 per course. The total cost for out-of-state students per course is $3,598. For part-time MBA students, tuition is $801 per credit in-state, and $1,106 per credit out-of-state. University of Baltimore Flexible MBA program applicants must have completed a four-year degree or its equivalent for admission. Work experience is not a requirement for admission. Though the majority of UB MBA students are full-time working professionals with an average of five years of work experience, the school does admit many highly qualified recent college graduates. To apply to the UB Flexible MBA program, applicants must submit a completed application form, all college transcripts from degree-granting and non-degree-granting institutions, a current résumé, and two letters of recommendation sent directly from the writer’s email. There is a nonrefundable $35 application fee, which may be waived for those in need of financial assistance. The UB flexible MBA also requires applicants to submit a personal statement of 1,000 words or less that outlines the applicant’s reasons for earning an MBA and why they feel they will do well in the program.Applicants to the UB Flexible MBA program must also send in their GMAT or GRE scores; however the GMAT can be waived under select circumstances; those interested should check with the school for more details.